A young Christurch ACT party member, Andy Moore is testing Labour's Electoral Finance Act with his Don't Vote Labour website. The Electoral Commission has contacted Andy demanding that he publish his name and RESIDENTIAL (No PO Box numbers allowed) address on the website to comply with the law. Andy lives at home with his parents, who understandably don't want their address publicised for any fruitcake to see on a politically contentious website. Andy stands to be fined up to $10,000 if he doesn't publish his name and address. He (and his parents) risk abusive calls and letters, possible property damage or worse if he does. This is the guts of Labour's appalling bill. The left is prone to violence and abuse-that's how they work. Anyone who stands up to them is a potential target. In 1987 new MP Ross Meurant made a speech in Parliament criticising several Maori radicals. The next day his garage was burnt down. That is why Andy and people like him are required to put their address against their opinions-for the intimidating effect that goes with it. We have anonymous voting, so that people may not be intimidated, harassed or ostracised because of their political opinions. Everyone understands that basic principle. That is why we must allow anonymous donations and expression of opinion-so that people may support the causes they choose without fear of economic, social, political or physical retaliation. Over the years I've received the odd death threat. It hasn't stopped me, but it certainly makes you more security conscious. In recent weeks I've been targeting local anarchists for their links to the "Urewera 17"-those people alleged to have been training with pistols, automatic rifles and molotov cocktails in the Bay of Plenty back blocks. ...also they (my wife and I) live in a freakishly clean suburb called Northwood where there are rules for everything from the car you park in the driveway to the amount of money you spend on landscaping. Would anyone like the address? phone number? As the parent of young children you can see how this sort of carry on might be intimidating on several fronts. I'm stating here that I no longer live in Northwood, because I don't want someone else to suffer harassment or property damage on my account. I hope I have made my point. The left will attack or intimidate those who oppose them. To require the left's opponents to make themselves open targets to any nutter under the sun, will have an inhibiting effect on freedom of expression. Just as it was intended to. For the sake of liberty, Labour's Electoral Finance Act must go. Thanks for proving my point Mr Y.
funny that you just accuse the left of intimidation. when helen clark's office window got smashed by an anti EFA person (most likely rightwing). just pointing out the inconsistency. Andy Moore. We facebooked each other last year and were debating Christianity and Christmas a few weeks ago. And now he's gone national! I've given him my support, I imagine he has now or soon will have a fair weight on his you ng shoulders. Likewise, whatever poor support I can offer to you, Trev, is at your service. Anon-You have no proof whatever for that assertion. While there are the odd ratbag on all sides, political thuggery comes overwhelmingly from the left. If you have no arguement-intimidate. Rick-thanks for that-have just emailed you. The left have always relied upon intimidation. Political correctness is one facet. Bolshevik style thuggery is another. A totalitarian state is their aim. That said, their success in this country is down to one thing more than most- the willingness of everybody else to succumb. 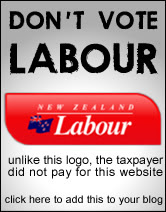 Why is it that so many NZers appear to be so unwilling to confront the left in the manner they should be confonted? Why do the lie down and allow the left to walk all over them? Resistance to socialism/ leftism in NZ just seems so damn lame. 2)death threats to pete lusk on the west coast by anti environment 'redneck vigilantes' and a letterbox bomb was detonated, also eggs were thrown at his house and pesticide put in his garden. sound like intimidation? the left has no monopoly on violence. a different picture comes out trev when you look at the larger context. another good example is the bombing of the rainbow warrior and the attack on a greenpeace boat by french commandos. another new zealand example is when simon oosterman got pepper sprayed at a GE free direct action protest. anon 1-I regard National Front types as left wingers-as were the Nazis and the Italian fascists. You're right about the pete Lusk incident. I had forgotten that, though I blogged about it at the time. wouldn't this person have had to register their name and address under the old electoral law as well? What a bloody ridiculous and childish post. I'd imagine something of this analysis coming from an over-eager 15 year old who's read Ayn Rand one too many times. 'The Left' is no more predisposed to violence than 'The Right'. That's a matter for the public record. Who remembers a blogsite that published the names and addresses of left-wing bloggers? And Trevor, please familiarise yourself with the real world. Nazis are universally considered to be right-wingers, just like Italian Fascism. No matter whether Ludwivg von Mises or Johnny Ultimate has told you so, Trevor, this is the virtually universal academic consensus. Only a handful of non-historian libertarian intellectuals challenge this consensus. so in conclusion there is plenty of rightwing violence, rightwing state violence and various other forms. not trying to say leftwing groups and people have not and do not commit violence - just that you trying to put it all on leftwingers is false. An thats not even going into US history, Italian history or far right fascist violence in Europe. Then there is the KKK, stormfront, white supremacist gangs,deathsquads in south america, anti union violence, occupations against indigenous people and so on. admit when you are wrong from time to time and you might gain a little credibility. Philip Agee, a former CIA agent who became a bitter critic of Washington's Cuba policy, has died aged 72, Cuban state media reported today. Agee quit the CIA in 1969 after 12 years in which he mainly worked in Latin America. He was later denounced as a traitor by George Bush Sr and was threatened with death by his former colleagues. His famous 1975 book, Inside the Company: CIA Diary, cited alleged CIA misdeeds against leftwingers in the region and included a 22-page list of people he claimed were agency operatives. Oliver Woods should not be so certain about the Left-Right line. The Nazis were National SOCIALISTS. That's what they called themselves. Heaps of them were ex communists. In East Germany under the Leftists, the Stasi terror arose. It was an easy transition from Nazi-ism. In West Germany under the moderate Right, the country moved into democracy. Many top historians have noted the close parallels between Hitler and Stalin (one wrote a book about it with "Parallel Lives" in the title). When the hard-left communist generals tried to revolt in post-Soviet Russia against the early move towards democracy, the trendy-lefty Reuters news agency led the way with the BBC by branding these pro-Stalinists "right wing", which was ludicrous. They wanted to confuse people. This was AgitProp similar to Woods'. Attempts to muzzle you Trev are absolutely appalling. I believe most people on the left are honourable, but the far left harbours some absolutely revolting nasties. The best way to neutralise such hostile bacteria is to expose them to the light! I don't share all of your views Mr. Loudon, but I admire your courage. Thank you, thank you, thank you for bringing to light just how deeply the far left extremists have infiltrated the Green Party. And for your work about the Chinese Communists and Maori youth. James and the last 3 anons. Am I the only one in the blogosphere who notices that those who tend to support the EFA and its requirements to name people for their views etc, also tend to be those who post anonymously on others blogs? In reply to the post about CIA defector Agee. For a balanced view read the 10 January obituary in the UK Telegraph www.telegraph.co.uk go news then select obituaries. Agee caused the death of British as well as American agents. He was fired because of his alcoholism and womanising. the point was he saw that the CIA do and couldn't continue because it was immoral. reminds me of the book 'confessions of an economic hitman'. stalin and hitler were the same, authoritarian meglomaniancs - like mussolini. Yes, Stalin and Hitler were very similar (and Mao etc). But how do any of us benefit from this willy-waving contest over whether they were 'left' or 'right'? We all agree they and their regimes were monstrous, right? So we actually do agree on something. Great. And we agree that our own ideals are the opposite of theirs, right? So what is the substance of these ideals? Let's take freedom of speech as an example. There is a great piece in the documentary 'Manufacturing Consent' where Chomsky basically says if you support freedom of speech, you support it for precisely those views you disagree with. In find neo-nazi views ignorant and pathetic but I defend a person's right to hold and express them (at least until they get a political and economic education and develop views that have some relationship to reality). Stalin, Hitler, Mao etc punished people for holding and expressing views that opposed their ideology. Any opponent of those ideologies should therefore defend freedom of speech, regardless of whether we consider ourselves 'left' or 'right', right? That's why Indymedia will never censor views for being 'right-wing'. Abusive - yes, commercial - for sure. But 'right-wing' posters, although they can expect to cop some flack from other users, are as free to post on Indymedia as anyone else. Stalin, Hitler etc also used violence and intimidation to force people to co-operate with their political vision. So the opposite of this is using open discussion and debate to find consensus around a shared vision, right? This is impossible when people tie themselves to irresolvable and futile arguments between the flawless perfection of 'left' or 'right'. But when we untangle ourselves from the prison of our own ideology and start talking nuts and bolts, it can be surprising how much we actually agree on. BTW Trevor, thanks for syndicating so many of the quality stories from Indymedia. Also, thanks for assembling your histories of left-wing activists in Aotearoa, despite your disparaging tone, the data you gather will help future historians ensure these people receive due credit for both the successes and mistakes in their political work.